A delightful design, with a dramatic meaning, because according to Navajo legend, Dreamcatchers catch your dreams. The good dreams find their way through the centre of the web, but the bad dreams are trapped in the webbing and held there to be burnt off by the morning light. 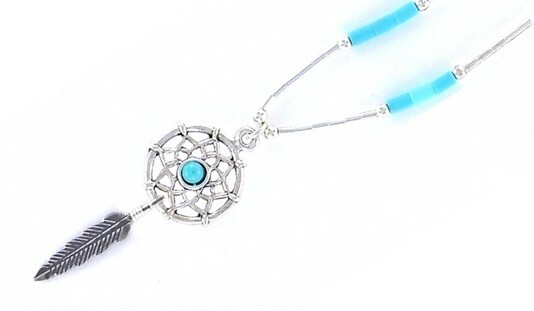 Ebchanting Sterling Silver dreamcatcher, with Turquoise centre and Sterling Silver detailed feather. Size: 1.5cm. Drop 4cm. Necklace 41cm (16").